The hotel is strategically located in the heart of the city of Salta. In the vicinity of the hotel guests will find multiple related commercial and cultural centres of this beautiful city. Guests can also visit and enjoy many different highlights of Salta. 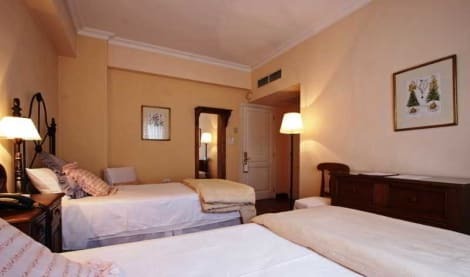 The hotel is a holiday complex type with well-maintained infrastructure. It was constructed in 2005 with its last renovation in 2010. It has a total of 66 rooms on 5 floors. Guests can make use of the laundry service and they may hire bicycles onsite. The classic rooms have incredible decoration and are internally facing, with a minibar, cable TV, a safe, wireless Internet and individually regulated air conditioning and heating. The en-suite bathrooms are fitted with a shower, bath and hairdryer. Rooms with either double or king-size beds are available. A direct dial telephone and an ironing set also come in each room. The Solar de la Plaza Hotel is located in a historical Spanish neocolonial big house from the 1950s where elegance, tradition and comfort are combined in unique fashion. The hotel offers outstanding services and premises, in a privileged location, only 4 blocks from Salta's main plaza and the city's commercial and financial district.